China does not invest in "vanity projects" in Africa and is helping the continent build its infrastructure, President Xi Jinping has said. He pledged an extra $60bn (£42bn) for the continent's development, as he opened a summit with African leaders in Beijing to boost relations. China is the single largest bilateral financier of infrastructure in Africa. But critics warn that African nations have been going into unsustainable levels of debt with the Asian giant. Mr Xi admitted there was a need to look at the commercial viability of some projects and make co-operation more viable. "China's co-operation with Africa is clearly targeted at the major bottlenecks to development," he told business leaders ahead of the opening of the two-day summit. "Resources for our co-operation are not to be spent on any vanity projects but in places where they count the most." 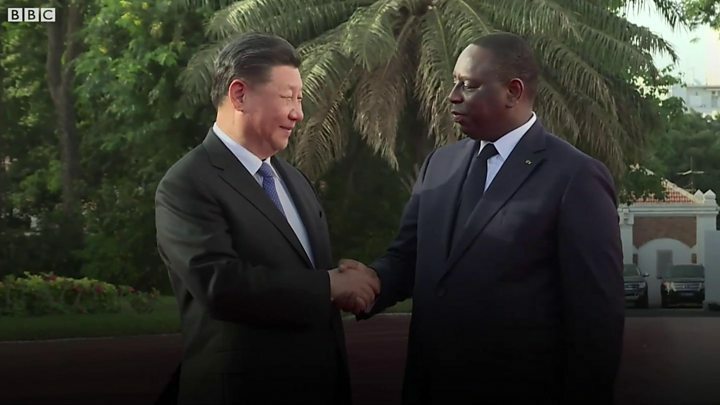 South Africa's President Cyril Ramaphosa welcomed China's growing involvement on the continent, saying he did not agree that a "new colonialism is taking hold in Africa as our detractors would have us believe". All African nations are represented at the summit, except for the tiny kingdom of eSwatini, formerly known as Swaziland. It is the only African state to maintain diplomatic ties with Taiwan. China's government does not allow countries to have official ties with both itself and Taiwan, which Beijing considers its own territory. Addressing leaders in Beijing's Great Hall of the People, Mr Xi said the $60bn would be made up of both aid and loans. It would be spent on eight initiatives over the next three years, including building more infrastructure and giving scholarships to young Africans, he said. "China's investment in Africa comes with no political strings attached," Mr Xi added. The $60bn pledge is over and above the $60bn China offered to Africa at a similar summit in 2015 in South Africa's main city, Johannesburg. China would also set up a peace and security fund and would continue to provide free military assistance to the African Union, he added. China lent around $125bn to Africa between 2000 and 2016, according to data compiled by the China-Africa Research Initiative at Washington's Johns Hopkins University School of Advanced International Studies. It has spent heavily on roads, railways, ports and other major infrastructure projects. This includes a $3.2bn railway line between Kenya's capital, Nairobi, and the port city of Mombasa.